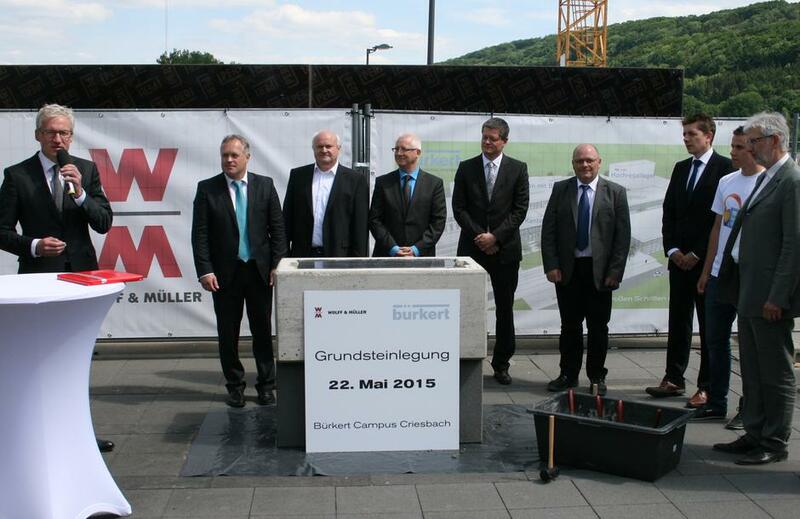 With a cornerstone ceremony on 22 May 2015 the planned new buildings at the Ingelfingen-Criesbach location of the fluid technology specialist Bürkert have entered the next phase. By the end of July 2016 and with an investment sum of around 30 million euros, the “Bürkert Campus Criesbach” will include a production building with offices, a training centre, a parking garage, a company restaurant and an 18-metre high-bay warehouse. The cornerstone ceremony was opened with a welcoming speech by Bürkert’s Managing Director Heribert Rohrbeck. “The large-scale project in Criesbach is a courageous and important step into the future for us and a clear sign of commitment to the Hohenlohe region. Based on our strong roots and values, we see the campus as a “factory of the future”, due to our far-sighted investment in a central training centre here. Thanks to everyone for your tremendous support,” said Rohrbeck. The welcoming speech by the management was followed by speeches by the 1st state official Gotthard Wirth, Ingelfingen’s mayor Michael Bauer and Axel Reimet of the general contractor Wolff & Müller. The highlight of the ceremony was the embedding of a time capsule in the foundation stone. The capsule contains a current issue of the Hohenlohe newspaper, coins, historic documents of the city, an issue of the employee magazine and engineering drawings by the company founder from the year 1950. In addition to the festivities for the campus, Bürkert also used the opportunity to pay tribute to the founder Christian Bürkert, who would have celebrated his 100th birthday on 04 May 2015. To celebrate this, participants in the festivities included current apprentices and former employees, some of whom had been employed at Bürkert since their apprenticeship. The high value placed on training since the founding of the first training workshop in 1951 and continuing to the present is emphasized by the new large training centre to be built on the Bürkert Campus. The preparations for construction on the Campus started on 12 January 2015 with the transplanting of trees, sewer construction and the landscaping of a parking lot. Construction officially began on 02 March 2015. Due to ideal building weather, the construction site is operating on schedule. With five cranes, the 21,150 square metre construction site is highly visible. The planned high-bay warehouse is growing continuously and the parking garage underneath the training centre can be covered with a concrete slab within the next one to two weeks. The parking garage required the pouring of 1,500 m³ of concrete, which was delivered to the construction site by about 200 concrete trucks from two plants over a period of 15 hours. The new parking lot will be ready for the final inspection within the coming days.